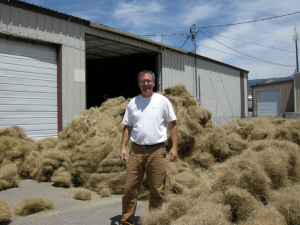 Great Basin Seed has been providing seed mixes to farmers and ranchers enrolled in the Conservation Reserve Program (CRP) program since it beginnings in 1985. We have provided millions of pounds of seed to thousands of farmers across the Great Basin and Intermountain West and across the United States. Each mix is carefully prescribed and blended to meet the needs of the location being seeded. The Conservation Reserve Program is a land conservation program administered by the Farm Service Agency (FSA). In exchange for a yearly rental payment, farmers enrolled in the program agree to remove environmentally sensitive land from agricultural production and plant species that will improve environmental health and quality. The long-term goal of the program is to re-establish valuable land cover to help improve water quality, prevent soil erosion, and reduce loss of wildlife habitat. We stock over 250 varieties of seed, including the varieties prescribed by your local Farm Service Agency and NRCS. We stock in-house the grasses, shrubs, flowers and pollinators prescribed by the CRP program. With our extensive selection of seed, mixing facilities and delivery network we can have your seed to you in as little as 24 hours! Seeding rates per acre PLS for each of the species in the mix. This information can be found on the forms provided to you by the CRP agent you are working with. We will gladly offer you a competitive quote on your mix. We can also help you arrange delivery and/or pick-up.